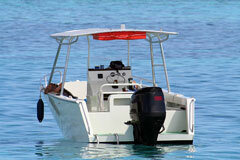 Today there is a wide variety of motor-powered boats to choose from. They come in all shapes and sizes, and are intended for different conditions and uses. Fishermen and duck hunters, for example, have quite different needs than water skiers or those who like to race their boats. 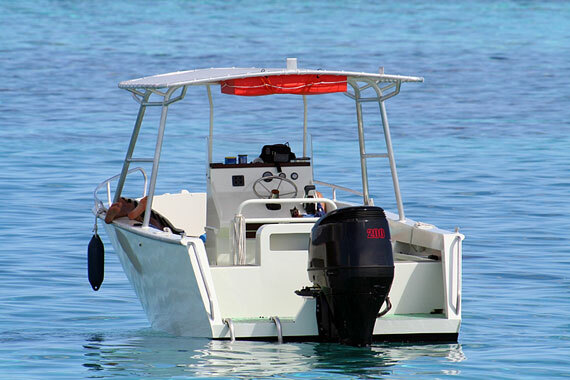 The motorboat has evolved over the years as knowledge and technology have increased. Long gone are the days of boats made of wood. Today, people are looking for solutions that make boats more streamlined and seaworthy. Modern composites are now a popular choice, while woven materials like carbon and Kevlar, specialty core materials, and advanced epoxy and polyester resin systems mean that hulls can be built both lighter and stronger. The stuntman is seen standing on the flimsy piece of furniture while being towed by a motorboat in White Bear in Saskatchewan, Canada. Daily Mail. Friday, 01 Jun 2018 18:48:19 +0100. There are many people who deserve credit for the evolution of the powerboat. One of the motorboat's most important advances was the deep v-shaped hull, which offers speed, comfort, and safety in rough waters. 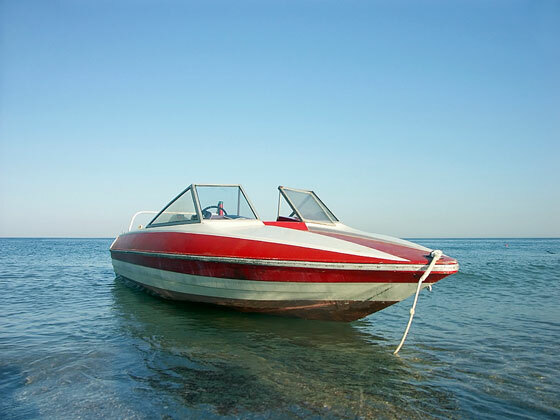 The deep-v hull was conceived in 1963 by Charles Raymond Hunt, whose other contributions to the powerboat industry include designing the 110 and 210 flat-bottomed double-ended powerboats, which were some of the first to incorporate marine plywood. Hunt also developed the cathedral hull shape used on Boston Whalers. Renato Levi is another person who is given much credit for how the motor boat evolved, particularly racing boats. Levi was known for developing unique concepts, including the delta boat, which was shaped like elongated triangles in vertical and horizontal planes. These boats featured a cutaway forefoot, high chine, and deep v hull sections which improved its performance in rough seas. Levi also came up with other concepts that improved the performance of racing boats. Rudolf Diesel also helped make great advancements in the motor boat industry. He is best known for inventing a 25-horsepower, four-stroke, single vertical compression engine. The diesel engine was introduced in 1903, and was an immediate commercial success. The person who invented the waterjet propulsion system is William Hamilton. The first system, which was introduced in 1954, was made up of a vertical-shaft centrifugal unit driven through a right-angle gearbox. This development not only added speed to powerboats, it also added incredible directional stability. Later models included straight-through flow as well as two-stage and three-stage axial flow turbines, which improved performance. Christopher Smith contributed to the world of powerboat racing when he designed a hydroplane-stepped hull that led to a series of specialty race boats built by the Smith-Ryan Boat & Exchange Company. Smith also designed the Miss Minneapolis, which broke the 60-mile-per-hour speed barrier in 1916 — the first boat to do so. Eventually beginning the Chris-Craft company in 1922, Smith was the first to apply the concept of mass-production to boat building. Today, Chris-Craft is still a household name, and is to the powerboat industry what Ford is to the automobile industry. Powerboat champion James Wynne also contributed greatly to the evolution of the powerboat, and is known for inventing the first successful stern-drive propulsion system in 1968. Wynne also designed the Maui Kai, the first catamaran to race in offshore competition.